An official in the Central Highlands province of Đắk Lắk has found the perfect way to drive the nation out of poverty, literally. And it is driving him crazy that people are not taking him seriously. In fact, he and his wife could be driven to suicide by this rejection, he has warned. What is it that drives Nguyễn Sỹ Kỳ, deputy head of the provincial Party’s Commission for Internal Affairs, to such despair? He can’t believe that that people don’t believe that his part-time work as a xe ôm (motorbike taxi) driver has made him a very rich man, rich enough to build a 200sq.m villa with a 153sq.m swimming pool and 80sq.m fishing pond. And he was able to do this on agricultural land, in clear violation of the law. 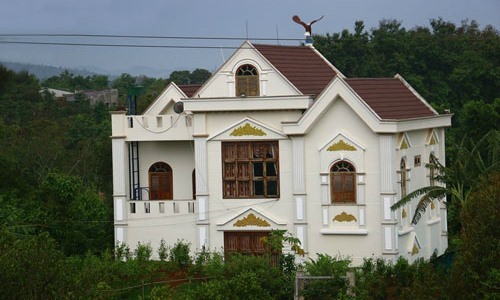 When authorities suggested that he demolishes his two-storeyed residential palace, Kỳ took umbrage. He said other people had built their houses (thought not as fancy) on agricultural land, too. And displaying the same drive that came up with the xe ôm story, he suggested a better solution to the thorny problem: just change the land-use purpose for that plot of land, from agricultural to residential.